Based on the number of students and faculty connecting to the network, NPS needed a 10 gigabit fiber connection to improve performance and secure connections. Leveraging relationships with the University of Oklahoma (OU), a plan was developed to utilize a shared data center with OU to promote cost savings for both institutions. 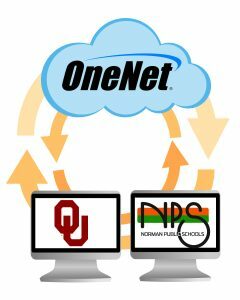 OneNet installed services on site to allow NPS administrators to monitor their overall connections. The upgraded connections allow students to receive and create digital content quickly. NPS is able to increase reliance on digital content for classroom work, eliminating waste and cost for physical assignments. NPS now has their data in a protected, secure location that can resist 200+ mph winds. Students now have better connectivity to access media-rich content for learning.